Have you ever wonder how to identify if a photo is original without any modification? If you like to find out this quickly, now there is a software utility, named as JPEGsnoop that can help you to analyze the images if they have been edited before. Every digital photo contains a plenty of hidden information and JPEGsnoop is designed to decode the inner details of JPEG and Motion AVI files. 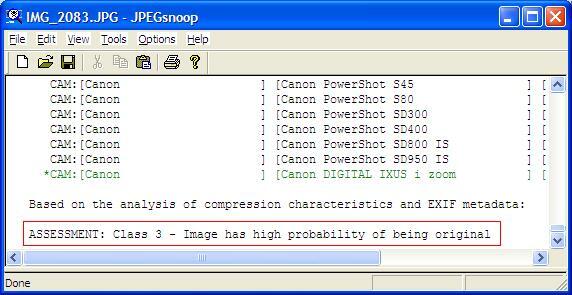 To determine whether a photo has been edited, JPEGsnoop uses the signature stored in its internal database for the camera model used to capture the image against a large number of compression signatures. If the compression signature matches Photoshop, then most likely the photo has been edited. Below are examples of the report analysis for original versus edited photo. There are quite a lot of useful information that you can get from the analysis report such as settings that were used in the digital camera, quality and nature of the JPEG image compression used by the camera in saving file and many more. If you are camera enthusiast, this information is pretty important for you to know which camera models produce better JPEG images so that you can choose a right camera to suit to your preference. JPEGsnoop version 1.3 is absolutely free for download. It is able to decode any file that contains an embedded JPEG image, such as .JPG, .THM, .AVI, .DNG, .CRW, .CR2, .NEF, .ORF, .PEF, .MOV, .PDF. If you feel this software is useful to you, go and download it at here for immediate use.